Entries for the 2019 Azbee awards will open in November! 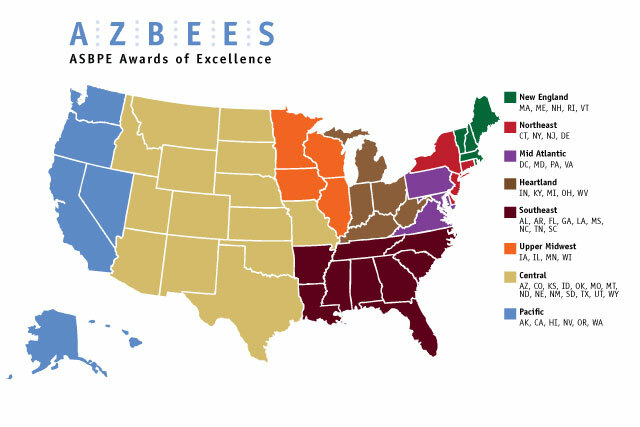 The American Society of Business Publication Editors (ASBPE) will open entries for the 2019 Azbee Awards of Excellence November 1, 2018. The Azbee Awards are highly competitive and celebrate the highest quality reporting, editing and design in business-to-business, trade, association and professional publications. The awards honor all types of publications including magazines, newspapers, newsletters, websites, and digital media. Take a look at the 2018 winner’s gallery for inspiration. The competition is open to all U.S.-based publications. Free ASBPE membership is not required for entry, but members receive a discount on entry fees. For both print and digital awards, the top entries nationwide receive national awards. To help young editors who are just starting their careers, ASBPE started the annual Young Leaders Scholarship in 2001. The scholarship allows younger editors who might otherwise be unable to attend the ASBPE National Conference or Boot Camps. It is open to all business editors, including print and Web. Scholarships pay the conference or boot camp and hotel room costs for up to five U.S. applicants. (Applicants or their publishing companies are responsible for transportation to and from the conference, any nonconference meals, and other incurred costs.) Scholarship recipients also receive a free one-year membership to ASBPE if they are not already members. Applicant must be 30 years of age or younger. Applicant must have worked at least two years as an editor of a business magazine or the magazine’s associated Internet publication. Candidacy must be sponsored by applicant’s chief editor. Applicant must plan to continue in the business press as a career. Applicant may not be a past ASBPE Young Leaders Scholarship winner. Experienced judges with background in business publications read each editorial, design, Web, newsletter, and Magazine of the Year entry. Their introduction to each entry are required and important essays of 250 words or fewer, one describing the publication’s mission and readership and one discussing both the work that went into the entry and its significance to readers. Editorial (and newsletter) judging — based on quality of writing, reporting and editing; development of the subject; presentation, and value to readers. Design judging — layout and composition; use of typography, graphics and photography; content; originality; relevance to the related story or publication, and how easily the entry communicates useful information to the reader. Web judging — reporting, writing, design, usability, readability, organization, value to readers, interactivity and effective use of online technology. The Cross-Platform Package of the Year category recognizes the coordination of print and digital media packages in the presentation of a single topic. It honors excellence in coordinating print with digital platforms, e.g. Web sites, e-newsletters, blogs, Webinars, or podcasts. The Newsletter of the Year category is open to B2B for-profit or not-for-profit print newsletters, whose frequency is weekly or less, i.e. do not enter dailies or twice-a-week publications. The Journalism That Matters Award was first presented in 2009. The award was inspired by ASBPE’s book of the same title, which features case studies of B2B journalists whose articles brought about change within their industries. Editors may nominate themselves or a deserving colleague. The first winner of the Journalism That Matters Award was HSToday editor David Silverberg in 2009. Silverberg was honored for his criticism in the pages of his homeland-security magazine of the National Football League’s unwillingness to run advertisements mentioning terrorism, borders, and immigration. After the HSToday articles, the NFL changed its policy. In May 2018, the ASBPE Foundation recognized the nonprofit VTDigger, an online publication covering Vermont business and government, for its investigative reporting. In 2014, VTDigger uncovered possible financial improprieties by one of Vermont’s most prominent business people, Bill Stenger, and his partners in an investment firm developing Jay Peak, a winter recreation resort near the Canadian border. As a result of several years of reporting, led by Founding Editor Anne Galloway, the U.S. Securities and Exchange Commission launched an investigation and later brought charges against Stenger and his partners. More about the establishment of the Journalism That Matters Award. This “best in class” prize, which comes with a $500 cash award, goes to the individual writer whose work most reflects inventiveness of approach (and especially use of narrative style), insightfulness, balance in the presentation of a complex subject, depth of investigation, and impact among the community of readers. Past ASBPE president Roy Harris reflects on Barr winners present and past, the judges, and the fun of giving out the awards in this blog post. David Hechler of Corporate Counsel magazine for his April 2013 article, “Lost in Translation,” which explained the legal developments surrounding Toyota’s problems with sudden acceleration. Burt Helm of Inc. Magazine for his November 2012 story, “After the Squeeze,” which examined the causes and effects of a bank-lending drought that has disproportionately hit the small-business people who are the publication’s main audience. Jenna Greene, for her article “Civil Inaction”, exploring the legal quagmire that has prevented victims of radioactive contamination near Washington State’s Hanford Nuclear Reservation from receiving justice, in the June 20, 2011 issue of The National Law Journal. Michael Peltz, for his article “Inside the Machine: A Journey Into the World of High-Frequency Trading,” in the June 2010 edition of Institutional Investor. Tom Zind, freelance writer, for his article “A Killer in the Ranks” in Electrical Construction and Maintenance (EC&M). Frank Lessiter, editor of American Farriers Journal, for his four-part series, “Soring,” from July/August to December 2008.
impact among the community of readers. To receive the Lifetime Achievement Award, a candidate must meet four requirements:1) Significant involvement (25 years or more) with business publications. Nominees need not currently hold editorial positions, and may be retired, but ideally will have spent the bulk of their careers in senior editorial positions or will have served the industry in some significant way. Nominees need not be members of ASBPE. Past nominees not selected in previous years are encouraged to reapply.Please provide the nominee’s current title and employer/business (if retired, please state such). Provide a brief description or résumé of the nominee’s job history. Include dates, job titles, magazines, companies.2) A commitment to editorial excellence. This may be demonstrated by general reputation of their publication(s); industry-related awards (e.g., ASBPE Azbees, Neal Awards, Folio:, Tabbies); internal company awards; other forms of recognition or other valid measures of editorial success.3) A commitment to the business/professional press. Nominees should be or should have been involved in lending their experience and time to benefit others in the business press. For example, this may be participation in local or national business press or related organizations; corporate or university teaching; mentoring programs; or significant research or publication of articles on business press issues.4) A commitment to the industry(ies) the nominee’s publication(s) serve. Examples might include committee work with trade or professional associations or standards groups; frequent speaking engagements at industry events; significant research or publication of articles on industry issues; or significant advocacy work with government agencies.The Lifetime Achievement Award winner will receive the award on the evening of the awards banquet, where the honoree also will receive a special tribute. The winner’s name will be announced to the public prior to the banquet. A call for nominations goes out around the beginning of each year.